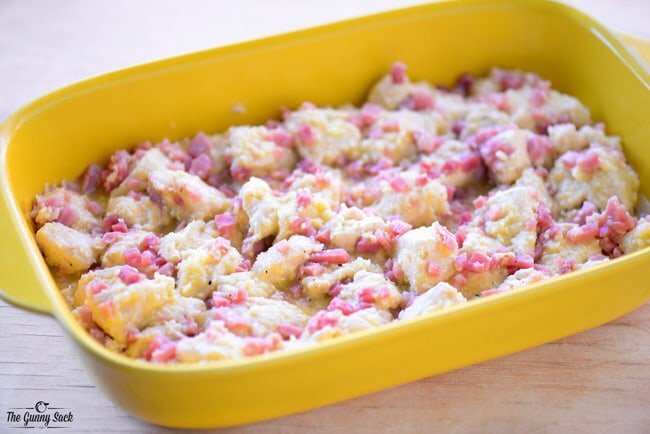 I’m sharing this hearty breakfast recipe for Ham and Cheese Pull Aparts with Gravy as part of a sponsored social media program by General Mills. I hope you all had a wonderful Thanksgiving! We celebrated at my sister’s house with 50 people. There was an impressive amount of amazing food and we had such a blessed day. When it comes to the holidays, we love starting the day off with a hearty family breakfast. It’s a great way to connect right away in the morning and eat delicious food at the same time. So, today I am sharing a recipe for Ham and Cheese Pull Aparts with Gravy that is perfect for a holiday breakfast, but easy enough to make for any weekend. 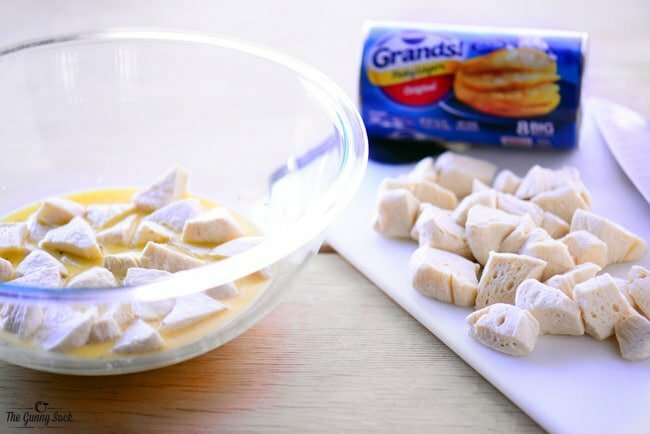 The thing that makes this breakfast casserole so easy is the Pillsbury Grands! Flaky Layers biscuits. We love using Pillsbury dough products from the pie crust I used at Thanksgiving to the cinnamon rolls we make for a special treat. But the Pillsbury dough products we use the most often are the Pillsbury biscuits. 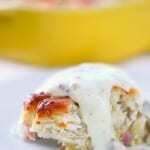 They are great baked as a dinner side and they are delicious in so many recipes like these Ham and Cheese Pull Aparts. Just pop open the can and cut each biscuit into 8 pieces. Or make it even easier by stacking biscuits to cut four at a time. Put the pieces into the egg mixture. Add diced ham (I used the precooked, pre-diced ham) and shredded provolone cheese and stir to mix. Pour into a greased 9×13 (3-quart) pan. Bake at 375 degrees for about 25 minutes, until golden brown. 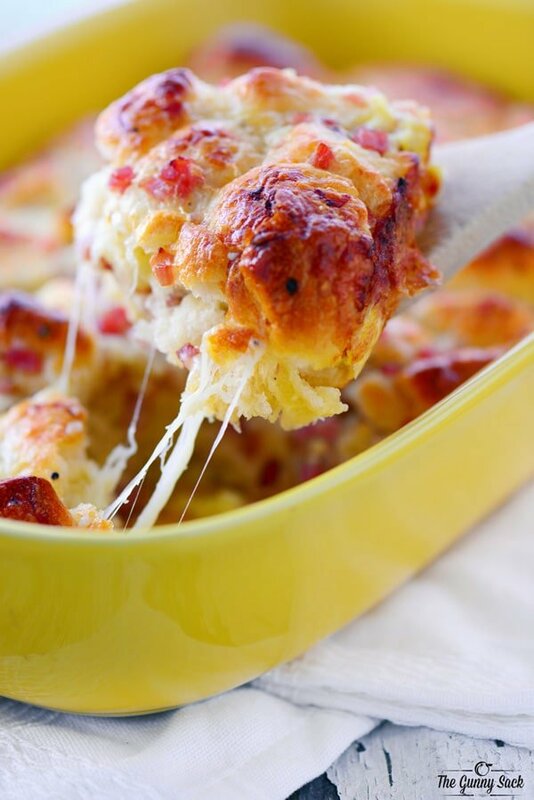 Delicious, cheesy and easy to make. You can eat it just like this and it is great, but then when you top it with warm country gravy, it’s fantastic! These Ham and Cheese Pull Aparts with Gravy are the perfect way to start the day. Try serving this to your holiday guests and enjoy a hearty breakfast before your busy day. Whisk eggs, milk and pepper in a large bowl. Add biscuit pieces, shredded cheese and diced ham, Stir to coat. Pour into a greased 9x13 (3 quart) pan. Serve with warm country gravy. Where is the gravy recipe? I’m thinking a little crushed dried onion added in might be nice. Great way to use up left over ham. This sounds perfect for a holiday morning breakfast! 🙂 Love how easy it is to make too. This looks incredible! So many warm, comfort-food flavors! Can’t wait to try! 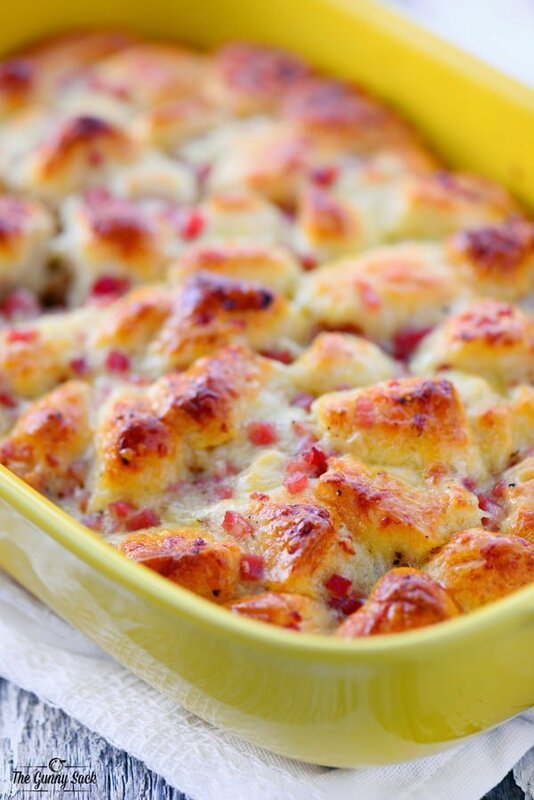 I love breakfast casseroles like this…it’s perfect for a holiday brunch! I can’t wait to try this. The best comfort food! Looks divine! Super simple comfort food, awesome! 50 people?! YAY! That sounds like so much fun! 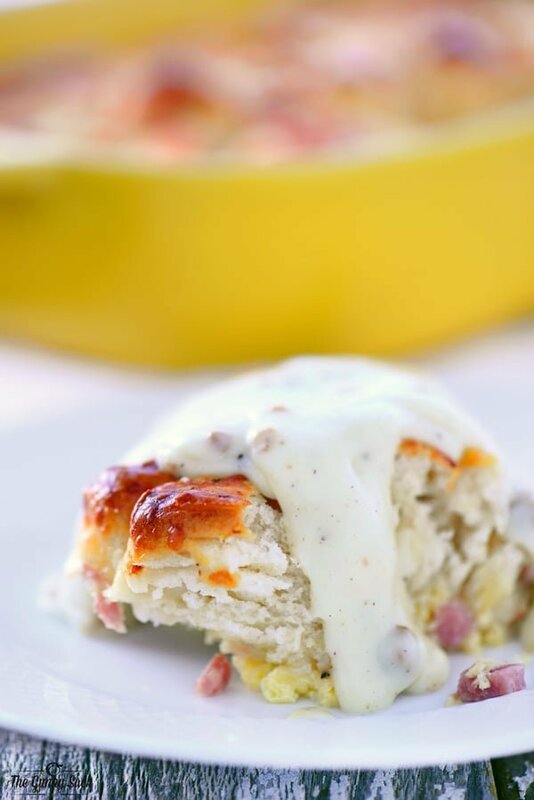 Your breakfast casserole sounds amazing, especially with the gravy on top! I want to try to fix it for myself and the family. oh wow! my family thanks you in advance for this recipe! !